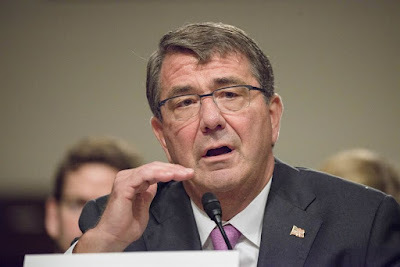 In a somewhat surprising turn of events, U.S. Secretary of Defense Ash Carter told the Senate Armed Services Committee that the United States will begin "direct action on the ground" against Islamic State in Iraq and Syria (ISIS) forces in both Iraq and Syria. The choice of words is interesting, avoiding use of the terms anathema to the Obama Administration: "combat" and "boots on the ground." The Secretary's alliterative declaration that American forces will focus on "the three R's: Raqqah, Ramadi and raids" - is a patent admission of what most of us military and national security policy analysts have been saying for months - current U.S. policy in the fight against ISIS is not working. The U.S.-led coalition air campaign is anemic at best - a majority of the armed sorties return to base with unexpended ordnance. The coalition pilots are hamstrung by over-restrictive rules of engagement and an unrealistic belief that air strikes can be conducted with nearly zero collateral damage. "Collateral damage" is the politically-correct term for civilian casualties. That said, I applaud the Secretary's remarks. It appears that he now realizes that even an aggressive air campaign would have difficulty being effective without some American boots on the ground. The nature of the targets presented by ISIS are difficult to detect, isolate and validate inside of the cumbersome decision cycle - the time required for a pilot to receive authorization - to strike a target. Use of manned armed reconnaissance and drones is drastically less effective without having trained U.S. Air Force combat controllers (called joint terminal attack controllers) or U.S. Army Special Forces teams on the ground to identify and either laser designate or electronically register GPS coordinates for the attacking aircraft. I have recommended that we use American eyes on the ground - a few troops embedded with our Arab or Kurdish allies - to guide the airstrikes. I call this the "Afghan model" - similar in concept to using U.S. special operations personnel embedded with Afghan Northern Alliance fighters to effectively target al-Qa'idah and Taliban formations, facilities and fighters. It worked there, it could work in both Iraq and Syria. For more details on this model, I refer you an article I wrote a year ago: Airpower versus ISIS - try the Afghan model. I further applaud the Secretary's selection of al-Raqqah and al-Ramadi as the two geographic areas of interest, especially al-Raqqah. We cannot address ISIS as two target sets, one being Iraq and the other Syria. We need to attack ISIS for what it is - one group spanning two existing countries. Of the two cities, al-Raqqah - ISIS's self-declared temporary capital city - should be the primary focus, with al-Ramadi a close second. Before the Iraqis can mount the long-awaited and much-delayed assault on Mosul, Iraq's second largest city which fell to ISIS almost 15 months ago, they will need to secure al-Anbar province, of which al-Ramadi is the capital city. ISIS's forces in al-Anbar are only about 65 miles from Baghdad. Thus far, the Iraqis have not demonstrated the skills necessary to retake al-Ramadi, let alone Mosul. For that reason, we should concentrate of degrading ISIS in al-Raqqah first. As for the third "R" - raids, this has been a successful tactic in Afghanistan against al-Qa'idah and the Taliban. Whether that translates to success in Iraq and Syria remains to be seen, and is not without risk or cost. According to the Secretary, "We won't hold back from supporting capable partners in opportunistic attacks against [ISIS], or conducting such missions directly whether by strikes from the air or direct action on the ground." I read "capable partners" to mean increased cooperation with the Kurds. It was on one of these raids that Master Sergeant Joshua Wheeler, a highly-decorated soldier of the U.S. Army's 1st Special Forces Operational Detachment-Delta (more commonly just called "Delta"), was killed in action. He was the first American to be killed in action in Iraq since the withdrawal of American troops in 2011. Based on the videos of the raid I watched, I consider this an American direct action, not as the Secretary called it, "a continuation of our advise-and-assist mission." If the United States adopts the "three R's" policy as the Secretary proposes, we should be prepared for additional casualties on all sides - increased losses for ISIS, but at the cost of higher numbers of civilian casualties, and unfortunately, the potential for American military losses. The Administration will have to convince the American public that the increased risk to our troops is worth the gain. The situation has changed since the withdrawal of all American forces from Iraq in 2011. While it is difficult politically to re-deploy American troops back into harm's way in the Middle East - boots on the ground this time - the threat from ISIS requires it. If we are going to conduct an air campaign, we need to do it right. We spent years perfecting the tools and tactics to employ precision-guided munitions effectively from the sky - use the whole team: pilots in the air and combat controllers on the ground. A new East-West proxy war has been heating up in Syria over the last three weeks, heralded by the deployment of more than three squadrons of Russian combat aircraft to an air base south of Syria's main port city of Latakia. The Russians wasted no time in commencing air operations against ground targets in the country. Despite the Kremlin's insistence that the purpose of its air campaign is to fight the self-proclaimed Islamic State (also known as ISIS, the Islamic State in Iraq and Syria), the vast majority of its attacks have targeted rebels attempting to overthrow the regime of President Bashar al-Asad. Bashar, as was his father, the notorious president/dictator Hafiz al-Asad who ruled the country ruthlessly for three decades, is a client of the Russians. Russian President Vladimir Putin is committed to the survival of the Syrian regime. The Russians have been incrementally pushed out of the Middle East since the Egyptians severed military ties with the Soviet Union in the mid-1970s. The only Russian military presence in the Middle East two decades after the collapse of the Soviet Union in 1991 has been limited to Syria. Although the Russians maintained a small cadre of military advisors at a few Syrian bases, Putin is most concerned about the joint Syrian-Russian naval facility at the port of Tartus. His support for the Syrian regime is focused on continued access to this strategic base - it is Russia's sole foreign naval base. The naval facility at Tartus is located just 35 miles south of the Humaymim Air Base, formerly a sleepy naval helicopter base and small civilian airport used by the al-Asad family. The base is only five miles from the al-Asad familial home in al-Qardahah, and is now an expanding Russian joint operations base. The Russians are flying daily combat sorties from the air base, striking targets mostly in the area northwest of Hamah and southwest of Aleppo (red box on map below) - some targets are as close as 20 miles from Humaymim. This area in Idlib and Hamah provinces has been the venue of heavy fighting between the Syrian regime on one side and a loose alliance of moderate and Islamic rebel groups on the other. Some of the rebel groups being attacked by Russian pilots have been supplied with U.S.-manufactured TOW anti-tank missiles. Over the last few months, these missiles have taken a heavy toll on Syria's tanks and armored personnel carriers. On the other side, the U.S. coalition continues its air strikes - by both manned and unmanned aircraft - against ISIS and elements of al-Qa'idah. An American armed drone (either a Predator or a Reaper) recently killed the leader of the al-Qa'idah element known as the Khorosan Group, a reputedly effective terrorist group located in the area west of Aleppo. The Khorosan Group has been accused of planning attacks on the United States - it was the perceived threat from this group that drove the timing of the initial American airstrikes in Syria last fall. The city of Aleppo is about to become the venue of a new proxy war between the Russians and the Americans. As the Syrian regime regains its momentum against the rebels under the umbrella of Russian airpower, the contradictory interests of the United States and the Russian Federation are about to collide. Although both countries are conducting bombing operations in Syria and have a common target in ISIS, their positions on the survival of the government of Bashar al-Asad are diametrically opposed. The Russians and their allies are in Syria to support the al-Asad government. To that end, forces are converging on Aleppo, once Syria's largest city. Much of Aleppo, including several UNESCO World Heritage Sites, has been destroyed in the fighting, in some cases erasing thousands of years of history. Forces moving into the Aleppo area to augment the re-energized Syrian Army and its associated loyalist militias (called the "shabihah" or ghosts in Arabic) include: additional Hizballah units from Lebanon (Hizballah websites report "two brigades" including armor, engineers and intelligence*), more Iranian Islamic Revolutionary Guard Corps (IRGC) Qods Force troops, other "elite" Iranian forces and interestingly, but not surprisingly, Iraqi Shi'a militias. These additional non-Syrian forces will be under the leadership of well-known - and revered in Iranian, Syrian, Iraqi and Lebanese circles - Major General Qasem Soleimani, commander of the Quds Force. The Iranian government has now acknowledged Iranian forces' involvement in the fighting in Syria. Just last week, Iranian President Hassan Rouhani publicly issued condolences over the death of a senior IRGC commander in the fighting near Aleppo. Things appear to be growing more serious on the American side as well. 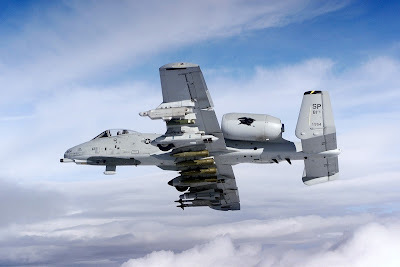 Over the last few days, the U.S. Air Force has deployed at least 12 A-10 "Warthog" attack fighters (above photo) to Incirclik Air Base on southern Turkey, less than 100 miles from targets in Syria - that is just minutes in a fighter jet. The "Warthog" attack aircraft augment the U.S. Air Force F-16 fighters and armed drones that have been operating from the Turkish air base since August. However, the Americans have decided not to attack Syrian military or militia targets, Iranian forces, Iraqi Shi'a militias or Lebanese Hizballah fighters on the ground in Syria, limiting their air strikes to ISIS facilities. By doing so, they have ceded control of much of the battle to the Russians. At some point, senior officials in Washington must realize that the Russians are now players in the region. We are involved in a proxy war again, albeit on a smaller scale than we "Cold Warriors" remember - we chose sides and did virtual but not actual battle with each other. The problem with proxy wars is that you must make sure that the side you chose to support actually represents your position and it worthy of that support. Is the United States willing to confront Russia? Are we willing to have American pilots confront Russian pilots in the skies over Syria? Are we willing to have American-Russian relations defined by confrontations in the Middle East? Good questions. The Russians have been clear about their objectives. Have we? * For my Arabic-speaking readers, watch the video announcing the arrival of additional Hizballah units in Syria. Turkish jets down Russian drone - what happened? On October 16, Turkish fighter jets shot down an unmanned aerial vehicle almost two miles inside Turkish airspace. 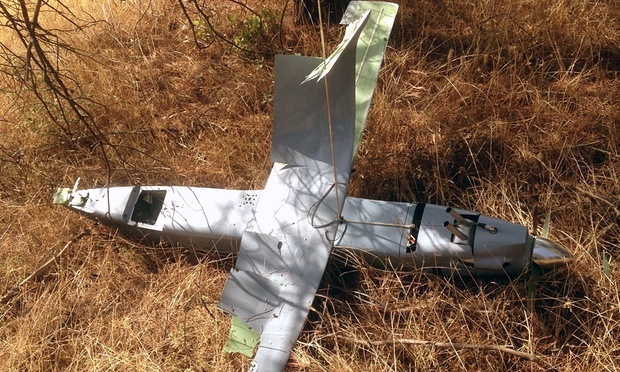 The wreckage appears to be that of a Russian ORLAN-10 drone. The exact model of drone is not important - for the purposes of this analysis, let us stipulate that this is a drone used by the Russian forces deployed to Syria. The bulk of Russian forces in Syria are located at Humaymim Air Base, co-located with Basil al-Asad International Airport in the town of Jablah, on the Mediterranean coast about 10 miles south of Syria's major port at Latakia (see map). If the ground control station for the Russian drone was located at the air base, its 140 kilometer (just over 85 miles) operating range would allow the Russians to conduct surveillance and reconnaissance missions as far away as the city of Aleppo. The drone went down near the Turkish city of Kilis (see map), almost 180 kilometers (110 miles) from Humaymim. Most of the Russian airstrikes have been concentrated east of the coastal area, specifically in Idlib and Hamah provinces, in the area approximated by the red box on the map. This area has been the venue of heavy fighting between the Syrian regime on one side and a loose alliance of moderate and Islamic rebel groups on the other. Some of the rebel groups have been supplied with U.S.-manufactured TOW anti-tank missiles - these missiles have taken a heavy toll on Syria's tanks and armored personnel carriers. * The recent increase in the number of TOW missiles in the hands of the rebels was partly responsible for the near collapse of the Syrian Army in most of Idlib and Hamah provinces. It was likely these setbacks on the ground and the belief that the U.S.-led coalition was about to declare safe areas and no-fly zones in Syria that convinced the Russian leadership (a euphemism for President Vladimir Putin) that absent additional external support, the regime of Syrian President Bashar al-Asad might fall. As with most militaries in the world, the Russians use drones to provide intelligence, surveillance and reconnaissance for both air and ground forces. When the Russians deployed to Syria, they brought drones with them. Although the Russians have access to Syrian and Iranian intelligence on their primary target set - the anti-regime rebel groups - all commanders prefer to have their own collection assets. 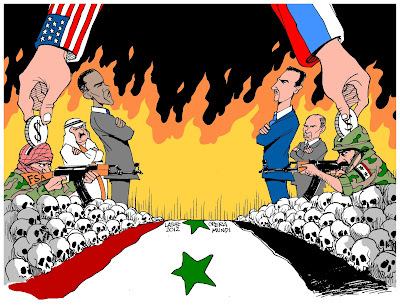 Russia's main objective in Syria is to support the regime of Bashar al-Asad. Despite the Kremlin's (another euphemism for Vladimir Putin) repetitious claims that Russian airstrikes are targeting fighters and facilities of the Islamic State (more commonly the Islamic State in Iraq and Syria, ISIS), most sorties flown by the Russians have attacked non-ISIS rebels in Hamah and Idlib. The Russians have also started hitting targets in Aleppo province as a prelude to a Syrian regime offensive there. As part of their air operations in Syria, the Russians are flying their drones over Hamah, Idlib and probably Aleppo provinces. As they get further north and east of Humaymim air base, the signals to and from the drones become weaker, as well as being affected by the coastal mountain range that separates the coastal homeland of Bashar al-Asad's 'Alawite sect from the Sunni areas to the east. These areas are being targeted by Syrian forces - forces supported on the ground by Iranian Islamic Revolutionary Guard troops, Hizballah fighters and just within the last few days, Cuban special forces soldiers, and in the air by the Russian Air Force. I believe that for whatever reason, the command data links between the ground station and the drone failed or were blocked by terrain, causing the drone to begin flying out of control. At some point, the drone crossed into Turkey - the Turks claim that two Turkish Air Force F-16 fighters subsequently shot down the drone. The Turks really had no choice but to shoot down the drone. They claim that they "warned" the drone three times - I assume they made broadcasts on the international emergency frequencies warning anyone operating the drones that the aircraft had violated Turkish air space. The pilots may have made passes in sight of the drone's cameras/sensors, but I suspect the drone was too far from the ground station to relay the images back. In addition to the sovereignty issue, the Turks would have needed to down the out-of-control drone as a safety issue before it approached any populated areas. There is nothing sinister here. Drones sometimes go astray as they lose contact with their ground stations - this is much different then what I believe were the two deliberate manned fighter aircraft violations of Turkish air space earlier this month. Those incursions were meant to send a message to the Turks. The Turks will complain, the Russians - if they ever admit that a Russian-made ORLAN-10 drone in pieces on the ground in Turkey is actually theirs - will apologize, and the carnage in Syria will continue unabated. Earlier this year, President Obama met with Saudi King 'Abdullah to discuss Syria. After the meeting, the President's deputy national security advisor reiterated the administration's concerns over supplying MANPADS to the rebels, but made no mention of anti-tank weapons. This comes just after the disclosure that the Saudi Arabian National Guard (SANG) took delivery of almost 16,000 TOW missiles late last year. The SANG is a force of about 100,000 men (organized into eight brigades) separate from the Ministry of Defense and Aviation structure and is a counterbalance to the Royal Saudi Land Forces. Let's look at this. That is a huge quantity of TOW missiles for that size force and for the potential threats the Saudis may face in the region. If you combine the armies of Israel, Iran and Iraq, you have a total of about 8,000 tanks. Even if you double that to account for armored fighting vehicles, acquiring 16,000 TOW missiles for the SANG seems a bit high. That does not include the well over 20,000 TOWs in the Saudi Land Forces inventory. Now we have TOW missiles showing up in Syria - it just seems too convenient. The Bergdahl court-martial recommendation - has someone leaned on the Army? From recent reports, it appears that the U.S. Army will not try accused deserter Sergeant Bowe Bergdahl in a general court martial. According to a statement from Bergdahl's civilian lawyer, the presiding officer at the Article 32 hearing will recommend to the general in charge of Bergdahl's case that the sergeant be tried by special court martial, a lower level court for what are equivalent to misdemeanors in the civilian justice system. If Bergdahl's lawyer is correct, the presiding officer will also recommend that the sergeant not be subjected to confinement or given a punitive discharge from the Army. 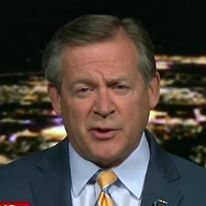 I wish I could say that I am surprised at the recommendations made by the Army lawyer, but given the politicization of this case by President Obama and his national security advisor, it is inevitable that Bergdahl will get special treatment. There were two major clues that this Administration has no interest in holding Bergdahl accountable for his alleged crimes. The first was the spectacle of President Obama hosting Bergdahl's parents in a Rose Garden ceremony at which he announced the release of five of the most senior Taliban detainees in U.S. custody in exchange for the return of their son. This ill-advised deal and public ceremony has set the tone that will influence any future prosecution of the soldier. The President's remarks seemed to paint Bergdahl as a hero rather than a soldier later accused of desertion. It is inconceivable that the President - he is the Commander in Chief of the armed forces - was unaware of the circumstances of Bergdahl's disappearance from his unit at a forward outpost in Afghanistan. 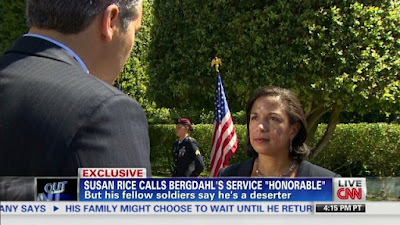 The second event was a series of appearances by National Security Advisor Susan Rice on the Sunday talk shows. Her repeated claim that Bergdahl "served the United States with honor and distinction..." again set the stage for either no or only low-level prosecution. Even as the Army formalized the charges against Bergdahl, Bergdahl's lawyer, Eugene Fidell, began the litany of excuses and rationale behind Bergdahl's actions. No one contests the fact that he left his unit in Afghanistan, but the fantasies that Fidell puts forth are almost laughable. Fidell is an excellent lawyer; he is doing his job. Bergdahl claims that he wanted to call attention to what he considered the poor leadership of his unit by leaving his observation post and running almost 14 miles to a larger base in order to lodge a complaint. I suspect Fidell sensed that the Administration wants this case to go away, and crafted a narrative that would lead to lesser or even no charges. This in turn saves the President any embarrassment based on his Rose Garden theatrics. I still had hopes that the Army would continue to do the right thing and fully prosecute Bergdahl. Let him have his day in court - let him explain to a general court martial why he left his unit while assigned to an outpost in Afghanistan. Have Bergdahl explain the series of emails and communications with his father that may have encouraged his decision to leave his post. Let the government put on its case, call all the witnesses who were at that same outpost and hear their recollections of what happened, not what Bergdahl's lawyer would have us believe. Let the officers impaneled to hear the case decide if Bergdahl was justified in leaving his comrades in a combat zone. If they find him guilty of the charges, the court can take into consideration the fact that he was a prisoner of the Taliban for five years when determining an appropriate punishment. I know there are many veterans who believe Bergdahl should serve a life sentence; I believe he has suffered enough for his decision to leave his post. That said, I still want him to stand up in a U.S. Army court martial and be held accountable for his actions. If found guilty, I believe he should be given a less than honorable discharge from the Army and if possible, enjoined from profiting from his errors in judgment - no profits from a book or movie rights, etc. I personally have no desire for him to be incarcerated, but I do not want him wearing a U.S. military uniform or enriching himself based on criminal behavior. When I heard Fidell's announcement about the recommendations that will be made as a result of the Article 32 hearing, I was disappointed. Then it got worse - Fidell complained about the recommendation for even a special court martial, advocating instead for an even less serious Article 15 proceeding, considered in the military as nonjudicial punishment, in other words, not a formal court martial. I was stunned - Article 15's are given for minor infractions, like missing a formation or instances of being late for work. An Article 15 is not appropriate disciplinary action for leaving a post in a combat zone. The presiding officer also recommended that Bergdahl not be subjected to a punitive discharge, meaning that he would retain all benefits afforded veterans who have served honorably. These include access to all Veterans Administration benefits - disability pay, medical care, etc. That too flies in the face of the serious nature of the charges. If found guilty - and that now appears to be a big if - in a special court martial, Bergdahl could face one year in confinement and a bad conduct discharge. This is not the last word. The recommendations for a special court martial and the call for no jail time or punitive discharge are just that - recommendations. The final decision will be made by General Robert Abrams, commander of U.S. Army Forces Command, the court martial convening authority. The general can accept or reject any or all of the recommendations. It is hard to imagine that this case is being conducted without what is called in the military "undue command influence." It began the day Bergdahl was released and continues to this day. Maybe I am being naive, but I still have hopes the Army will do the right thing - convene a general court martial and give this case the gravity it deserves. For the last week, Russian fighter and fighter bomber aircraft have conducted about 60 airstrike operations in Syria. Despite Russian claims that they are attacking targets of the Islamic State (also called the Islamic State in Iraq and Syria, or ISIS), all but two of these strikes appear to have targeted anti-regime groups attempting to remove the Ba'ath Party government of President Bashar al-Asad. On Wednesday, the Russians added a new weapon system to the mix, launching 26 "Kalibr" (U.S Defense Department designation: SS-N-30) sea-launched cruise missiles (SCLM) from as many as four frigates in the Caspian Sea. These missiles are the Russian equivalent of the U.S. Navy Tomahawk Land Attack Missile (TLAM) and flew almost 950 miles through Iranian and Iraqi airspace en route to their targets in Syria. The escalation represented by the addition of SLCMs to the campaign is interesting. Thus far, we have seen an intense aerial bombardment campaign using more effective weapons than those employed by the Syrian Arab Air Force (SYAF), but very few precision-guided munitions. Most of the videos and photographs published by the Russian media or leaked from Humaymim air base south of the port city of Latakia show a lack of targeting pods or PGMs on the Russian fighters and fighter-bombers. Most of the Russian weapons appear to be general purpose gravity bombs, more commonly known as "dumb bombs." The SLCMs, on the other hand, are in fact PGMs, able to hit targets accurately from up to 1550 miles away from the launch point, depending on missile variant and size of the warhead. Now that we have seen the initial series of Russian air operations, the type of weapons being used and the targets being struck, it is apparent that the Russians are preparing the battlefield for a Syrian military push to re-establish itself in west central Syria, particularly the main lines of communications between Damascus and Aleppo. The rebels systematically pushed out the Syrian army from most of Idlib province, especially in an area known as the al-Ghab plain, only one mountain range away from the coastal enclave near Latakia that is home to the 'Alawis, the sect to which Bashar al-Asad and most of the senior military and political leaders belong. As shown on the map, the overwhelming majority of Russian strikes are focused on the area in Idlib province north of Hamah. These targeted areas are in the hands of either the Free Syrian Army or the Jabhat al-Nusrah (the al-Qa'idah affiliate in Syria) - the tan area on the map - who control the main Damascus-Homs-Hamah-Saraqib-Aleppo highway, while the regime controls the areas shaded in blue. If the Syrian regime is to reassert control over its own territory, regaining control of this Damascus-Aleppo corridor is essential. The Russian bombing campaign is preparing this area for a renewed Syrian Army ground assault. Leaflets dropped in this same area north of Hamah have warned the local population of impending "anti-terrorist" operations. This impending operation should come as no surprise to any military analyst. It is the same plan we would have developed - this particular plan is credited to Iranian Major General Qassem Soleimani. Soleimani is the commander of the Islamic Revolutionary Guard Corps' elite Qods Force. On a visit to Russia in July, the general laid out his assessment of the potential for the collapse of the Bashar al-Asad regime in the absence of external assistance. He also laid out the plan that could turn it around - with Russian air support. In response, the Russians moved an expeditionary force to Syria composed of three squadrons of combat aircraft - they have not been shy in conducting the offensive operations necessary to support a Syrian military push to retake the main lines of communications. Thus far, the Russians have only struck a few ISIS targets, probably to provide the fig-leaf that their operations are actually a campaign against the Islamist group. Despite the Russians' offers to cooperate with the United States ostensibly against ISIS, the U.S. Secretary of Defense refused and offered to only hold "technical" talks to deconflict air operations. His stumbling, almost nonsensical, response - canned remarks about Russia's "flawed strategy" in Syria - underscores the perception in the region that the anemic U.S.-led air campaign against ISIS remains ineffective. At the same time, Secretary of State John Kerry has again proposed a no-fly zone - a move supported by former Secretary of State (and presidential candidate) Hillary Clinton. With the Russians now in Syria with three squadrons of combat aircraft in direct support of SYAF operations, that ship has sailed. That idea may have worked in 2012, but not now. What's next? The Russians will continue to pound anti-regime targets, the Iranians will continue to move more of its Qods Force and Lebanese Hizballah troops in support of Syrian military operations. There will be a concerted Syrian Army operation to move into the area north of Homs. Failing any American support to the moderate rebels allied with the West, the Syrians, Iranians and the Russians will be successful in reestablishing Syrian regime control. At some point, the United States will need to redefine its goals in Syria and its strategy to achieve them. The dual-track policy to remove Bashar al-Asad and to "degrade and ultimately defeat" ISIS now seems unlikely - the Russian presence has forced our hand. When Russian President Vladimir Putin saw what he assessed as a threat to his country's national interests, he acted - decisively. Not only have the Russian asserted themselves in Syria, they are now making inroads with the Iranians and even the Iraqis. Iraqi politicians are asking for Russian help against ISIS, supplanting the United States as the "go to" major power. With clarity of purpose and decisive action, this round goes to the Russians. The fact that I have to write this disgusts me. I just finished an interview on CNN (in my role as a paid military analyst) to discuss the latest accusations from the international medical relief organization Médecins Sans Frontières (MSF), known in English as "Doctors without Borders." I have great respect for MSF - they are usually found in areas where other medical personnel will not go, mostly in areas underserved by their own governments or areas ravaged by war. In almost all cases, doctors and nurses serving in these areas do so at great personal risk. Kunduz, Afghanistan fits the description exactly, being both underserved by the Afghan government and the scene of an ongoing battle between the Taliban and Afghan forces. Kunduz recently fell to the Taliban, the first major city to fall to the group since 2001. The Afghan forces attempting to retake the city were supported by U.S. special operations forces on the ground and U.S. Air Force fighters and gunships in the sky. The MSF-operated hospital in Kunduz - easily the best medical facility in the area - was severely damaged by what MSF claims was "aerial bombardment" during the fighting in the dark, early hours of Saturday. As a result, 22 people were killed, including MSF staff and patients. Obviously, this is a tragedy - but to immediately label this as a war crime perpetrated by the U.S. Air Force is contemptible. Let's look at the statement issued by Christopher Stokes, MSF’s general director: "Under the clear presumption that a war crime has been committed, MSF demands that a full and transparent investigation into the event be conducted by an independent international body. There can be no justification for this abhorrent attack on our hospital." Mr. Stokes went on to claim that the hospital’s main building was "hit with precision" for more than an hour, even after it alerted American and Afghan military officials. They claim - and I have no reason to doubt it - that the organization provided the GPS coordinates of the hospital to Afghan and American authorities. Unfortunately, providing locational data does not immunize facilities from being caught in crossfires. No doubt Mr. Stokes is angry and upset about the incident at the hospital - we all regret any loss of innocent lives. That said, the director general needs to carefully consider his choice of words. Accusing the U.S. Air Force of a war crime with no facts to back it up is beyond the pale. First of all, Mr. Stokes has no way of knowing what caused the damage to the hospital. While the current thinking is that an American AC-130 gunship was responsible for the mistaken attack, it may turn out that the damage was caused by errant mortar or rocket-propelled grenade (RPG) rounds fired by the Taliban, both in use that night near the hospital compound. Beyond that, the words "under the clear presumption that a war crime has been committed" is accusing the U.S. Air Force of intentionally firing on a hospital. I find that insulting and unnecessarily inflammatory. Stokes doesn't know what happened - that is why there are multiple investigations into this incident. Does Mr. Stokes have any harsh words for the Taliban, whose attacks on Kunduz precipitated the entire confrontation? Any demands for investigations into war crimes committed by these Islamist thugs? According to the Afghan police commander on scene in Kunduz, Taliban fighters were using the hospital compound for cover - a charge vehemently denied by Mr. Stokes. As a retired U.S. Air Force officer, I know that this tragedy was not an intentional attack on a medical facility - that is not who we are, not what we do. If Mr. Stokes believes that, perhaps he needs to find another line of work where flights of fiction and fantasy are part of the job description.